Y uno más son diez. Learn New Year's Resolutions with Elmo! 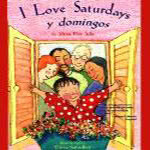 Count from 1 to 10 in English and Spanish with your child. Sing Diez Deditos (10 little fingers).